Kayaking in the bay of Francois (photo: Jocelyn Pride). Atlantic puffin nesting of the cliffs of Saint-Pierre et Miquelon (photo: Tony Beck). 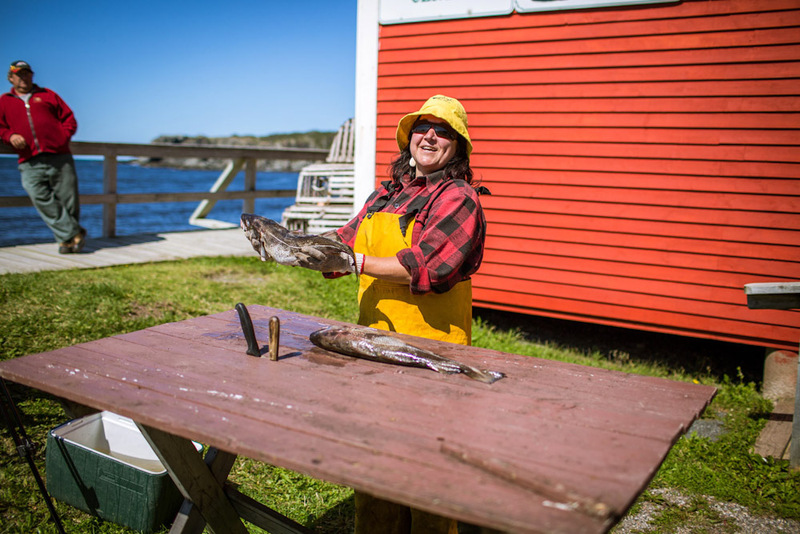 A Trout River local prepares the catch of the day, the town is a small fishing community of Ontario (photo: Dru Kennedy). 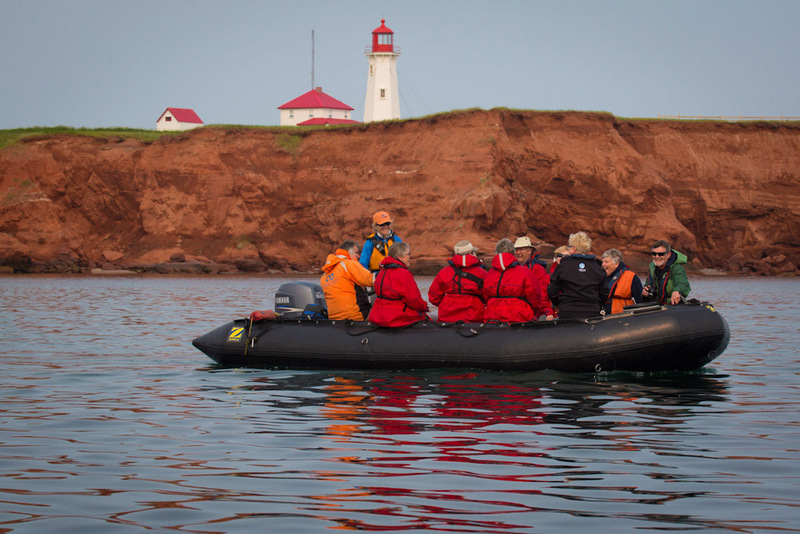 Visitors cruise Canada’s Maritimes in the Zodiac (photo: Jocelyn Pride). The tiny community of Francois is perched on a cliff off newfoundland's south coast (photo: Tony Beck). 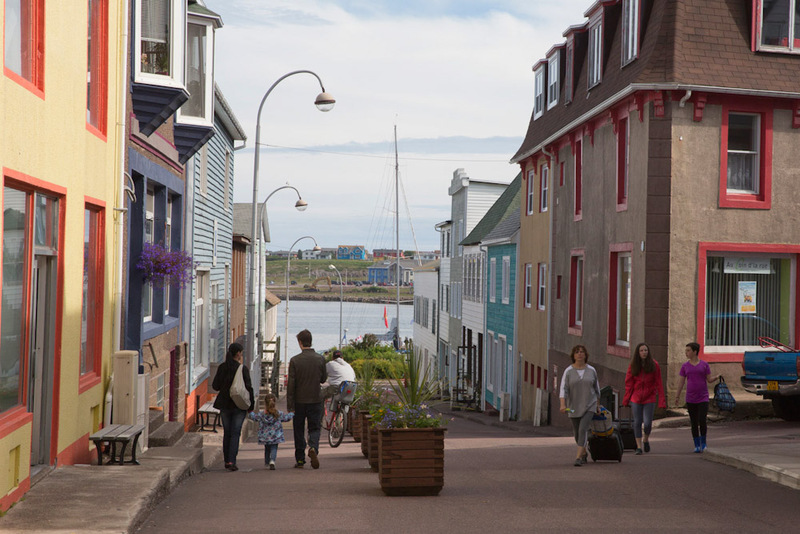 The streets of Saint-Pierre et Miquelon (photo: Jocelyn Pride). Stand up paddle-boarding in the Canadian Maritime (photo: Marilyn Scriver). 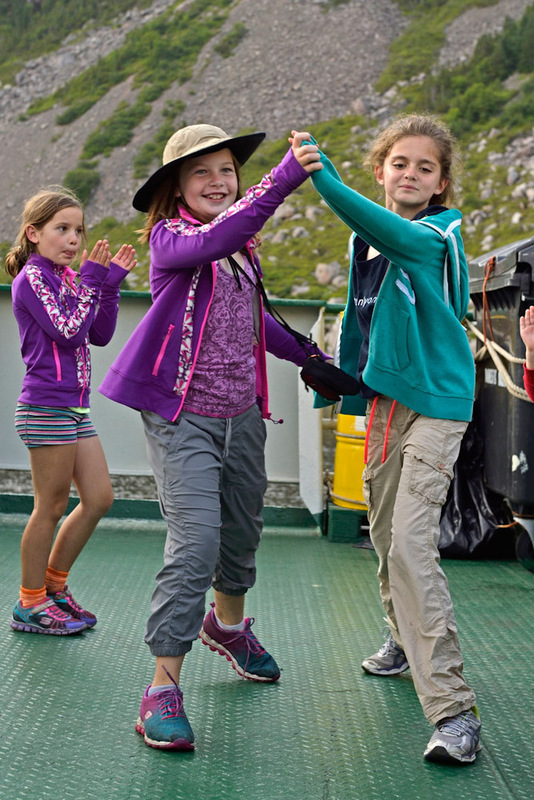 Kids enjoying a traditional dance at Francois Bay, Newfoundland (photo: Tony Beck). 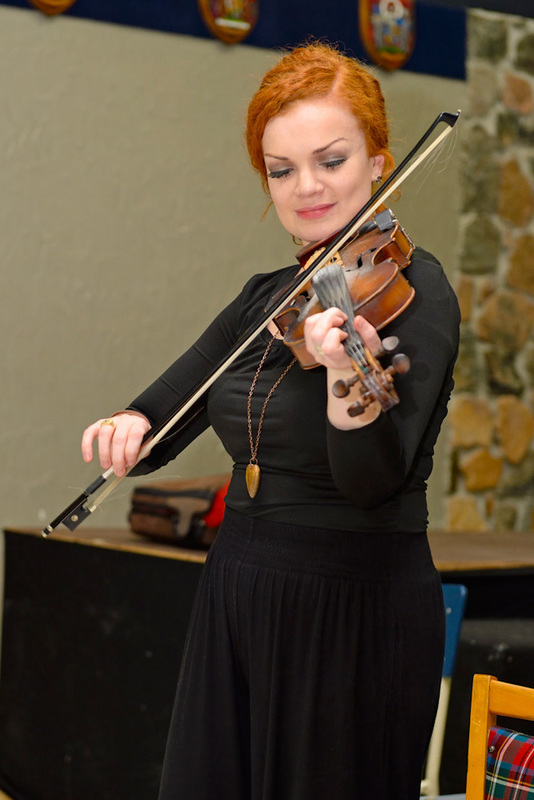 Traditional fiddle performance on Cape Breton Island (photo: Tony Beck). 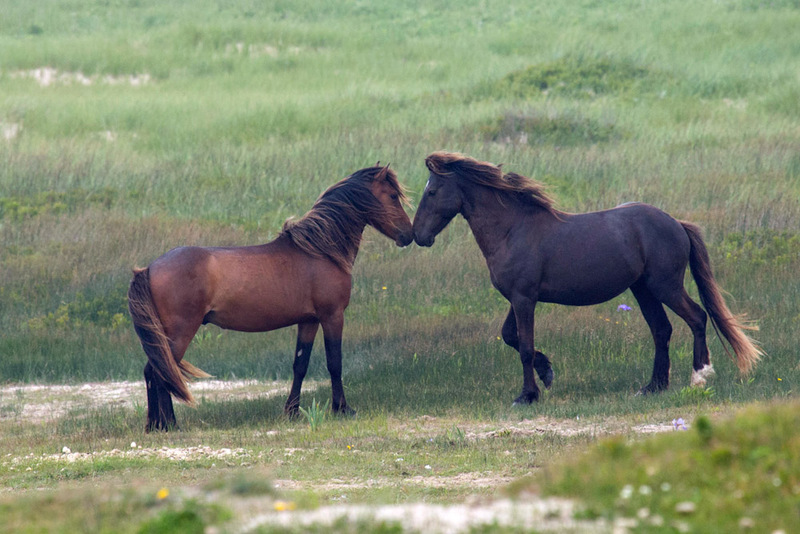 Wild horses on the protected Sable Island of Canada (photo: Jocelyn Pride). 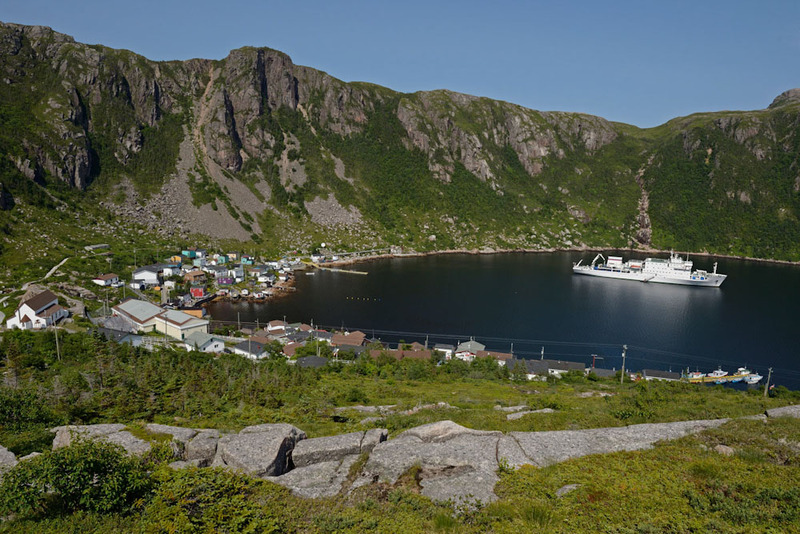 An island with wild ponies, a little piece of France, a site where the earth’s mantle is visible these are just a few of the highlights of this adventure cruise through some of eastern Canada’s most remote island communities. By Nikki Bayley. A helicopter swoops above our Zodiac as we putter past cliffs of prime nesting real estate off the coast of Saint-Pierre et Miquelon. 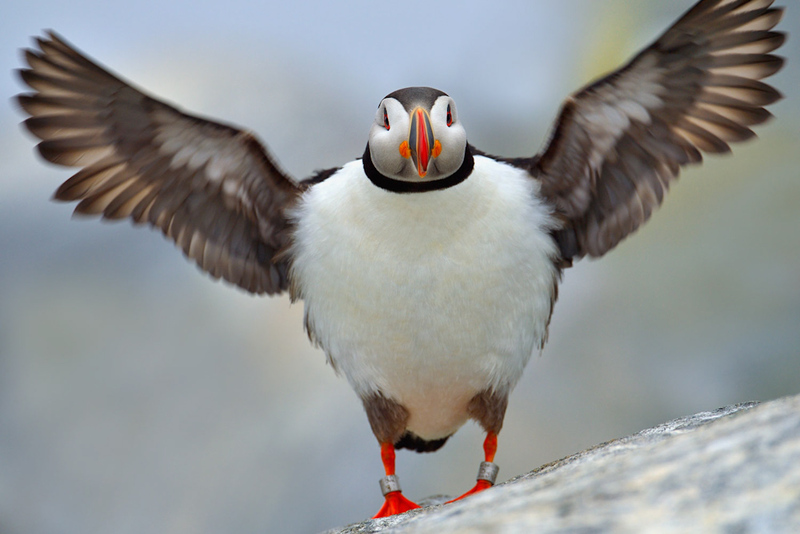 It starts an incredible chain reaction – first a cloud of Atlantic puffins zoom across the sky, their yellow feet glinting in the sun, then the sky turns black as about half a million birds join the fray. Jacques Sirois, One Ocean’s resident naturalist, excitedly rattles off names faster than a footie commentator: guillemots, razorbills, herring gulls, kittiwakes; it’s a dazzling aerial display which has me converted from ‘Birds? Meh.’ to ‘OMYGOD! BIRDS!’ in a trice. One Ocean’s Fins and Fiddles expedition around Canada’s Maritimes is described as an ‘expedition with a hot tub’. A Russian polar research vessel that has been repurposed for passenger voyages, the Ioffe (with an ‘i’) has a mostly Canadian crew of ‘adventure concierges’ on hand to help passengers get the most from their 10-day cruise, whether that’s delving into the history of the islands, getting pro-tips on photography or learning to kayak, paddleboard or guiding mountain-bike expeditions. Our first taste of adventure comes in the ship’s mud room as we get decked out in waterproofs, disinfect our boots and vacuum kit to make sure no stray grass or seeds make it onto the protected sands of our first destination. Sable Island sounds like a fairy tale – an ever-shifting sandbank shaped like a crooked smile where wild horses live. Known as the ‘Graveyard of the Atlantic’, its treacherous shores have claimed the wrecks of more than 350 ships since 1583. Now one of Canada’s newest National Parks, fewer people have stood on its distant shores than the Arctic. I feel privileged as I clumsily roll out of the Zodiac (it takes a few days to do it like a pro) on to the dunes. This freshwater oasis is Canada’s largest breeding colony of grey seals, boasts 18 species of shark off its coastline and is home to five Parks Canada staff and some 350 wild horses. It’s tough walking in soft sand in gum boots, but I fall in step with Jonathan Sheppard, Sable Island’s Parks Canada Manager, as we go searching for the island’s famous equine residents. We pass gleaming white bones sinking into the sand, and Jonathan points out the lusher patches of vegetation – they’re horse’s graves. We stagger to the top of a Sahara-like dune and look down – the Ioffe looks tiny below and sand sharply pings me in the face in the wind. And then we see them, looking for all the world like glossy show ponies. We have to stay 20 metres away from them but, as I walk down the dunes, we’re close enough to watch them shake their manes as they nibble grass and drink from the freshwater pools. I take off alone to explore the island, reveling in its curious geography, the flowers in the barren landscape, and how cold it is, even in summer. 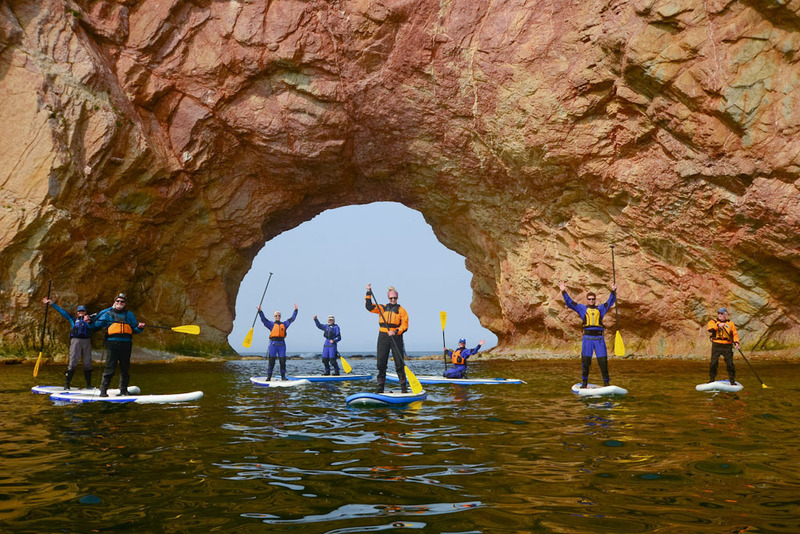 The next day brings bags of fresh-made cheese curds from the Pied-de-Vent fromagerie to snack on as we take a whistle-stop bus tour around one of the impossibly picturesque Iles de la Madeleine with its iron-red sandy beaches and floral-painted cottages. We take in the marine museum and a traditional smokehouse, where the Arseneau family smoke everything from cheese to malt to make beer. Felix Arseneau, the great-grandson of its founder shows us around and we hear the sadly familiar story of how overfishing decimated fish stocks in eastern Canada in the 1970s. But there’s a happy ending here, with the slow return of herring thanks to better management in the 1990s and the re-opening of the traditional smokehouse. Back on board, ship life revolves around meal times and, with just 96 passengers, there’s room for everyone to eat at one serving with generous multi-course meals. Thanks to the Russian kitchen team, Russian flavours feature with fragrant borscht appearing alongside more Canadian fare such as salmon and lobster. My shipmates vary in age from 17-month old Caitlin to 92-year old Harvey, a former mayor of Louisbourg, the historic spot from which we set sail, and which boasts a superb recreation of an 18th-century French fortress. We soon fall into a routine, with morning briefings on where we’ll sail each day, along with nightly announcements for those who want to kayak, paddleboard or cycle the next day. You can be as active, or lazy, as you feel. I skip a bike ride in favour of a long soak in the rooftop hot tub and a session in the library, curled up studying maps of the region feeling no guilt. My school teachers would not recognise me later in the week as I decide against playing cards in the bar. I head instead to the lower deck to hear a lecture by Dr Sean Cadigan, one of the ship’s experts, on the geological marvels of Gros Morne National Park where we’re heading the next day. The park is home to the oldest animal ecosystem in the world and it’s thanks to the Precambrian fossils (which I now know means they have no shells) embedded on its seafloor, that we can prove Darwin’s Theory of Evolution. Armed with my new knowledge, exploring the following day with Kevin Barnes, the Vice Chief of the Qalipu Mi’kmaq First Nation, and a Parks Canada interpreter is a joy. I can understand so much more of this extraordinary place, one of the few spots on Earth where you can see the earth’s mantle-tectonic plate theory at work. I head to a small fishing community, Trout River, for lunch which turns out to be a creamy bowl of chowder, bobbing with fat chunks of freshly caught seafood, and a juicy cod burger. Later I meet one of the residents, Helen Howe hanging out hand-knitted socks and hats on her washing line to sell. “This is on-line shopping in Trout Lake,” she chortles as I pick a soft pink knitted hat to take home. The 10 days pass too fast, paddling remote shores by kayak, finally becoming a pro at the ‘sailor’s grip’ required to get in and out of the bobbing Zodiacs lashed to the side of the ship and learning to enjoy life with no wi-fi or phone service. It turns out you can have fascinating conversations when you can’t just Google something you’re not sure of! We visit the tiny community of Francois (pronounced France-way) with a population of 80, perched on a cliff at the end of a long fjord off Newfoundland’s south coast. This isolated ex-fishing village welcomes us with a tour of their (single) street and, that night, throws a ‘kitchen party’ for us in their community centre, the locals favouring an arms-to-the-side take on traditional Irish step dancing, and us One Oceanites, arms flailing alongside. The last day takes us to another country, thanks to the quirks of Canada’s embattled past between the French and the English. Saint Pierre et Miquelon is both a tiny archipelago and the last remnant of New France. This curious colonial quirk is a facsimile of France, just south of Newfoundland. You need euros to pay for the buttery croissants and we are visited by French passport control before we’re allowed to visit, but the wine is cheap, the pastries delicious, and its streets are filled with Renault and Peugeot cars. It is one more Maritimes miracle that few have even heard of, never mind visited, and the perfect illustration of One Ocean’s Fins and Fiddles trip: quirky, off the beaten path and pretty much guaranteed to fill you with astonished delight. 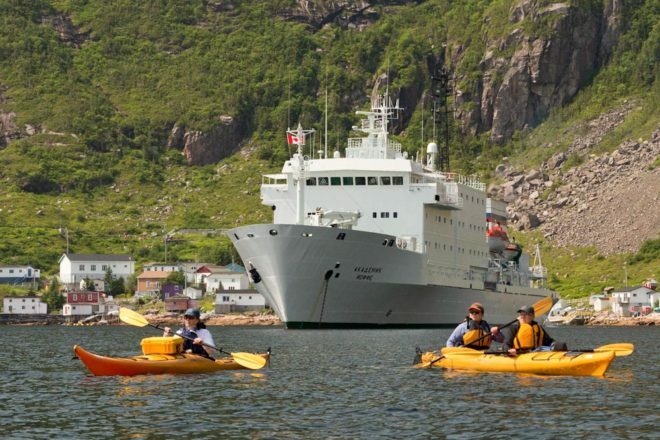 One Ocean Expeditions offers an 11-day Canadian Maritimes Fins and Fiddles trip on board Akademik Sergey Vavilov. The ship makes two sailings from Louisbourg in July 2017, for ports including Sable Island, Gros Morne National Park, Newfoundland and Saint-Pierre et Miquelon. The cruise is full-board, with 24-hour tea, coffee and hot chocolate, and juice at breakfast (other drinks cost extra). Interested in more unique Canadian experiences?